Cinematography is a fine art. It has its own lexicon, its own math, and an intimidatingly vast breadth of equipment in its arsenal. In short, it requires extensive training and experience to master movie lighting. However, like most elements of filmmaking, cinematography is grounded on a few basic principles that are easy for anyone to understand. In this article, we’ll discuss what goes into a textbook four point setup for movie lighting. The premise of this lighting setup is that it allows the cinematographer to illuminate a subject while simultaneously being able to control (or remove) the appearance of shadows. The setup can be fine tuned for dramatic/thematic effect, and control how much the subject stands out from its surroundings within the frame. The key light is the primary light source. It’s orientation, angle, and level of focus or diffusion will determine the overall look of the completed setup. The focal point of the key light should be the subject of the scene. The fill light is used to control the level of contrast on the subject by reducing the harsh shadows created by the key light. It should be dimmer and less focused than the key light, and positioned relative to the former’s direction. The back light is positioned behind the subject. When the subject is a person, the back light’s primary purpose is to bring out the contours of the subject’s frame and highlight the hair. This effect can be calibrated to cause a ‘glow’ around the subject that will make them stand out from the background, creating a greater sense of depth in the scene. The background light is used to highlight the scenery behind the subject. The purpose of this light is to add a greater sense of separation between the subject and and background and prevent the image from appearing overtly two-dimensional. Depending on the contrast-capturing ability of the camera you are using, the background light may need to be either dimmer or as bright as your key light. This should at the least give you a sense of where you should position your lights when shooting a basic scene. Remember, the effect of cinematic lighting is extremely mutable. Slight changes in saturation, focus, and angle can shift the overall look – this is a good thing. Experiment with your lighting setups, play with filters, gels, and flags. The more you practice, the easier it will become to improvise. Picking up a decent cinematography textbook is highly recommended as well: there are many finer techniques you can learn to get the most out of your image. Celtx Studio’s Shot Blocker tool provides a convenient way for you to plan out your lighting and equipment setups. 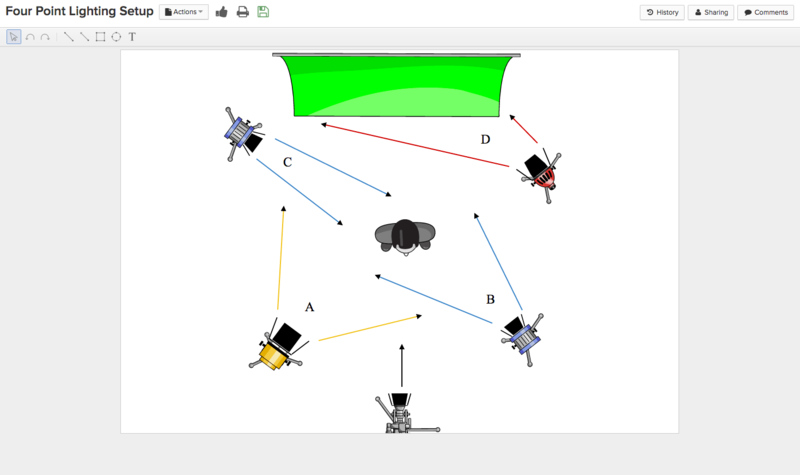 As you experiment, use the Shot Blocker to sketch out your setups, take technical notes and add sample stills, creating your own reference library to keep you agile on set.